Nasarawa, Nigeria—The toddler’s face lights up when her father walks in the door after a long day of work. Peter Anmusku picks up his 1-year-old daughter, Naomi, and she curls into him, giggling. The two of them laugh and play. With his daughter on his lap, Peter and his wife, Ruth, share a smile of their own. Manufacturing agricultural equipment is an arduous job, and Peter is no doubt exhausted. But this father knows that time with his young daughter and son is important too—though it wasn’t always like that. “Before, I was out all day and night. But now, I go home to be sure to play with them,” Peter says. 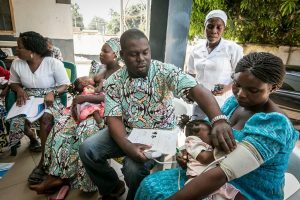 A New Approach to Antenatal Care: In Groups! When Ruth was pregnant with Naomi, her second child, she went to the local health facility for her first checkup. There, she met Rhoda, a health worker who was excited about a new way they had begun delivering antenatal care (ANC). Rhoda invited Ruth to join a group of other pregnant women who were close in gestational age for her future ANC visits. She explained that they would meet at scheduled times and, in addition to still having a brief private consultation, Ruth would have the opportunity to form relationships with these other women while learning with and from each other. At each meeting, they would discuss topics relevant to their stage in pregnancy: sharing beliefs, challenges and ideas for overcoming those challenges. This is group ANC (G-ANC). 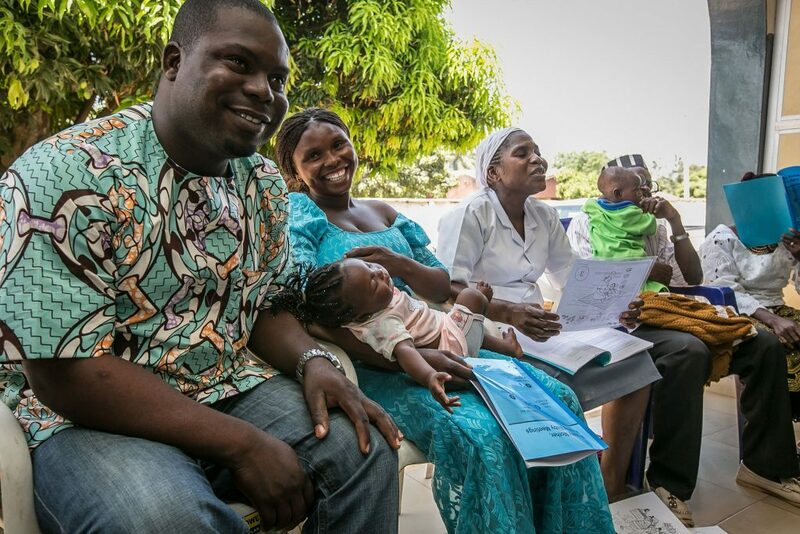 In 2016, Jhpiego began working with the Nasarawa State Ministry of Health and the Kenyan Ministry of Health to implement the first multisite, multicountry study of G-ANC in low- and middle-income countries, with funding from the Bill & Melinda Gates Foundation. The G-ANC meetings are designed to foster positive relationships with the staff in the health facility and empower women to become advocates for their family’s health, during pregnancy and beyond. Staff at 10 health facilities in each country were trained by Jhpiego on how to provide G-ANC, equipped with the basic supplies needed and mentored by Jhpiego staff. This experience and care was compared to women receiving regular, individual ANC at 10 other facilities, and results are striking! Women and providers both prefer this new group style of care—women show it by coming for far more ANC visits, and providers have shown it by continuing to offer G-ANC even after completion of the study. Together, Ruth and Peter decided she would try G-ANC. They’re glad they did. Ruth delivered Naomi at the same health facility, with Rhoda by her side—a trusted companion after so much time together. Childbirth was smooth—and even if it hadn’t been, there was plenty of skilled care to handle any complications. 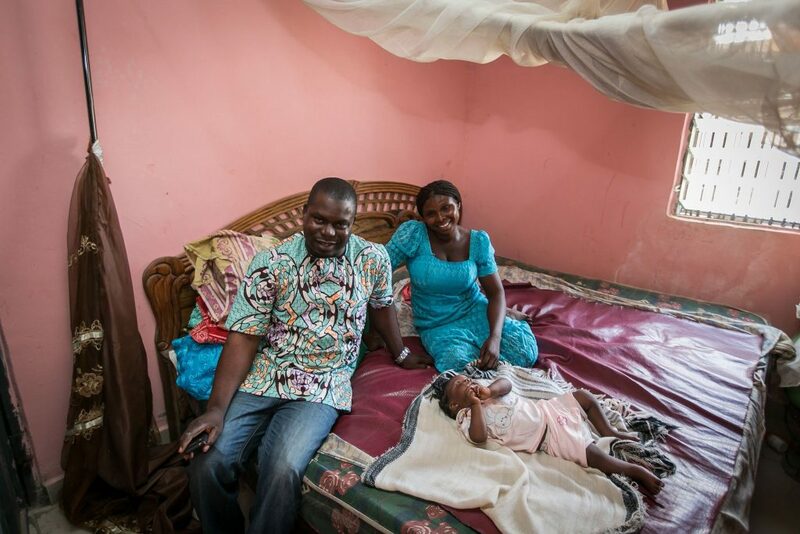 A few months after birth, Ruth and Naomi returned to the health facility for more group care. The next set of four meetings—also designed and introduced by Jhpiego—was focused on well-woman and well-baby care. In these Healthy Mother, Healthy Baby meetings, the same group of women reunite after childbirth and continue discussions every 3 months on topics relevant to their own health and family planning, and to the baby’s growth and development. Women learn how responsive parenting, nutrition, hygiene and activities to stimulate development all work together to create healthy, strong, smart children. They provide each other with advice and support—what every parent needs! To help babies develop to their full potential, different ways to play and interact with children are taught at each meeting. A room full of small babies can get noisy at times, but meetings are full of songs, games and laughter—the same kinds of activities that Peter and Ruth practice together at home with Naomi today. 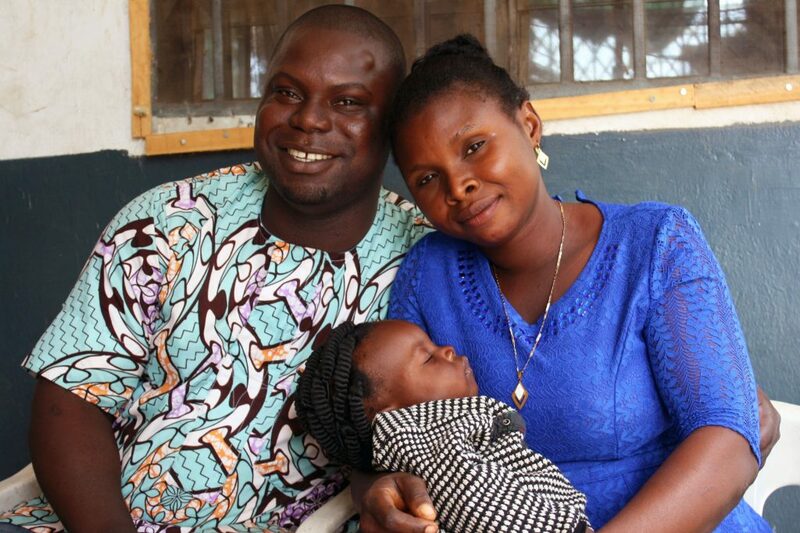 Ruth remembers how her previous pregnancies and visits to her health facility went. G-ANC was nothing like that. “Truly, [my health providers] were not like this before the program started. They tell us things, they advise us on how to take care of ourselves, how to take care of our health and our babies,” she says. She’s not alone—both providers and clients have expressed more satisfaction with G-ANC than regular ANC. It’s clear that this family is thriving. Peter is effusive of how much he learned from the program, about how to keep the house clean and safe, and how to play with their kids. 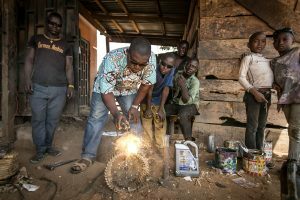 “My hope for my children is that I can take care of them very well so they can have good schooling and achieve their dreams,” he says.